Sticks can be harmful to your pup. No doubt about it: puppies are major chewers! In fact, they'll chew on just about anything and everything they can sink their developing gums and teeth into. And yet, while there are plenty of things for them to chew, tree sticks are certainly not the best option. Puppies chew on things to explore their world as well as to relieve stress. Mainly, though, they chew as a part of teething behavior. Around 4 weeks of age, a puppy starts getting his milk teeth, which remain until he begins teething at 4 months (a process that can continue in small dogs until around 7 months). As the permanent adult teeth come in, puppies often chew to ease gum soreness. To a pup, a wood stick is simply another chew object. But sticks can be dangerous for puppies. Sticks can splinter and break off, lodging wood fragments in your puppy's mouth and esophagus, causing internal damage. In addition, swallowed pieces of wood, especially large pieces, can cause more serious problems, such as a perforated intestine or stomach lining, or an obstruction of your pup's bowels. Wood, especially sticks, is almost always readily available. 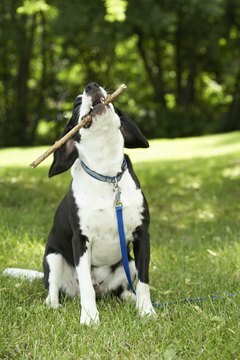 So before you take your pup outside to play, pick up any sticks in the yard, and also secure wood piles or logs lying around. If your dog is still attracted to wood, try adding a natural repellent, like bitter apple, or a repellent spray to keep him away. Finally, use negative reinforcement techniques, such as saying "no," whenever your dog goes near wood. Fortunately, many chew toys are available for teething pups or dogs who just like to chew. Make sure you buy one rated chew "tough" so that your dog won't destroy it in a short session; ideally, the toy should not destruct. If your puppy is teething, offer a freezing wet washcloth for him to chew on, which is soothing to his gums. Supervise your puppy so he doesn't chew up and swallow any pieces of the washcloth.